Alonzo M. Drake was born in Adrian, Georgia, in 1894 and graduated from high school there in 1914. He enlisted in the Army in September 1915 and served with the Coast Artillery Corps and the Signal Corps. In 1917, General Drake took pilot training with the Aviation Section of the Signal Corps at Issoudon, France and on October 26, 1917 was commissioned a First Lieutenant in the Aviation Section of the Signal Officers Reserve Corps. In November 1919, he was assigned to the Aviation General Supply Depot at Souther Field, Georgia, and on July 1, 1920, received his regular commission as a First Lieutenant in the Air Service. General Drake assumed command of the 81st Service Squadron at Mitchel Field, New York, in 1921. Three years later he was transferred to the Operations Division, Office of the Chief of Staff of the Army. In 1926, he was assigned to the Supply Division of the Air Materiel Command at Wright Field, Ohio, and in 1934, went to Panama to command the 80th Headquarters Squadron. In August 1936, General Drake entered the Army Industrial College, graduated in June 1937, and was assigned to the Industrial Planning Office at Detroit, Michigan. He completed the three month course at the Air Corps Tactical School, Maxwell Field, Alabama, in June, 1940 and was assigned to the Central Procurement at Detroit, as chief of all procurement contracts, in June 1943, he assumed that position at Chicago, Illinois, and in January 1944 was named technical adviser to the air inspector at the Air Materiel Command at Wright Field, Ohio. General Drake in June 1944 was assigned as air inspector of the Army Air Forces in the Mediterranean Theater. In September 1945 he became acting air inspector of the Continental Air Force at Bolling Field, D.C. in January 1946, he was named air inspector of Strategic Air Command, also at Bolling Field. General Drake was appointed air inspector for the European Division of Air Transport Command in July 1946. A year later he was named chief of staff of the European Air Transport Service, with station at Wiesbaden, Germany. In January 1948 he became air inspector of the U.S Air Forces in Europe, also at Wiesbaden. The following May he was redesignated inspector general of that organization and served until June 1951. In July 1951, General Drake was appointed assistant chief of staff of Tactical Air Command, with headquarters at Langley Air Force Base, Virginia. He was named chief of staff of Tactical Air Command in March 1952. General Drake has been awarded the Legion of Merit and Bronze Star Medal. He is rated a pilot, combat observer and aircraft observer. 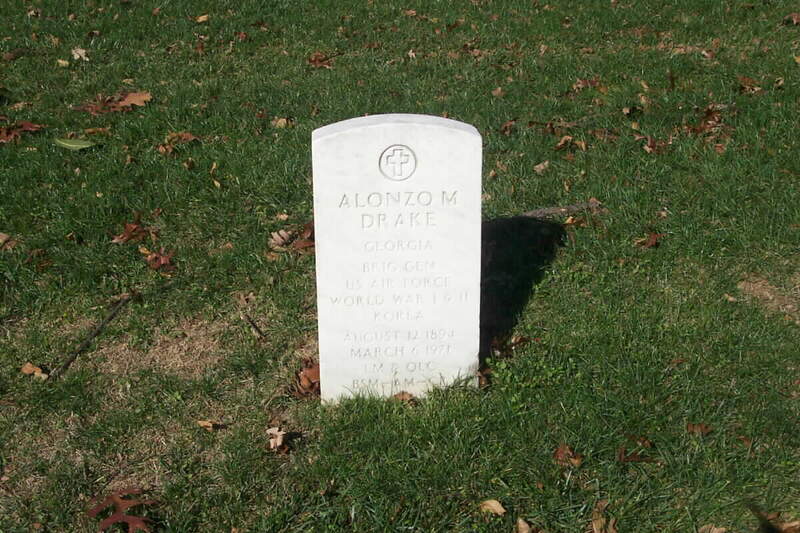 By Scott B. Thompson, Sr.
Alonzo Drake, Adrian's Little General, was a man of small stature at five feet five inches tall, but was a giant among the military material officers of the United States Army Air Force. Drake was born on August 12, 1894 in the community which became Adrian, Georgia. His Drake family's roots run deep into the history of southern Johnson County. He possessed a rich heritage of military service, with ancestors fighting in the Civil War and the American Revolution. The family traced their ancestry back to Thomas Drake of England, a brother to the legendary explorer of America, Sir Francis Drake. In his nearly four decades of service, Drake was highly regarded by his peers as a man who could get things done. His career spanned the development of fighter planes from bi-planes to jet aircraft. Drake entered the United States Army at Egmont Key, Tampa, Florida in 1915. Ironically first basic training assignment came as a trainee in the aviation section of the Signal Corps at Old Fort Drake. Airplanes were in their infancy in the United States Army. There were only a few trained pilots. Army officials knew that when the United States entered World War I, aircraft would be the key to victory. After three months, Private Drake was promoted to Corporal. Drake was again promoted - this time after only five months - to Staff Sergeant of the 162nd Coast Artillery. Drake learned to fly a Curtiss Jenny at Mineola, Long Island, New York - quite an amazing feat for a young man who came from a town, which had only a few automobiles. As the United States entered the war, Drake continued his flight training. On October 26, 1917, Drake earned his wings and a commission as a Second Lieutenant. His first assignment as an officer was with the aviation section of the Signal Corps in France. Just a few weeks before the end of World War I, Lieutenant Drake was promoted to Captain. He was only twenty three years old. Drake served a brief stint as Adjutant of the American Expeditionary Forces in Tours, France. It was in France where Captain Drake, met and married Alice Roberts, the daughter of a French Army officer. The couple were married for over fifty years. After the war, Captain Drake remained in France for several months on occupation duty. Drake returned to Georgia where he served as commander of the Aviation General Supply Depot in Americus from 1919 to 1921. In 1921, Drake transferred to the 81st Service Squadron at Mitchell Field in New York, where he served for three years. Drake was promoted again - this time to a desk job in the office of the Chief of Staff's Operation Division. During his two year stint in Washington, Drake developed a talent for the business side of the Army Air Force. From 1926 to 1933, Drake served in the Air Material Command at Dayton, Ohio. In 1934, Drake was sent to Panama to command the 80th Headquarters Squadron in the Panama Canal Zone. During 1936, Drake attended the Army's Industrial College in Washington. The brass began taking notice of his uncanny ability to manage the daily operations of the Air Force. His first assignment after graduation was as director of Air Corps Procurement in Detroit, Michigan. Shortly after, he was again promoted to Director of the Central Air Force Procurement District in Dayton, Ohio. Drake kept advancing up the ladder when he was named director of procurement for fourteen states. Drake commanded hundreds of officers who were resident agents in aircraft and parts plants around the country. When the Japanese invaded Pearl Harbor in December of 1941, our country was not prepared for war. Many of the war planes we had were outdated. The biggest war machine in the history of the world was about to be born. Now a Colonel, Drake worked with manufacturing plants all over the country. During the late 30s, Drake gained an acute knowledge of the problems of operation and production of aircraft. His knowledge of Industrial Mobilization Programs brought him acclamations from his superior officers. In his years in Detroit, Captain Drake won the praise and admiration of the automobile magnate, Henry Ford. Ford described Drake this way: "The Little Colonel is really a big fellow. He fights his way through red tape." During the first years of World War II, Drake was directly responsible for the quality and quantity of the aircraft from the production lines and for internal security of our country's aircraft manufacturing plants. Colonel Drake began his service overseas the day before the invasion of Normandy on D-Day, June 6, 1944. On March 23, 1945, Lieutenant General Baker awarded the Bronze Star to Colonel Drake for meritorious achievement in the performance of his services in 1944. General Baker cited Colonel Drake for outstanding initiative and zeal in his untiring efforts to establish a comprehensive inspections procedure. Drake was named as Inspector General of the Air Force in the Mediterranean Theater of Operations after the end of the war. Drake was nominated for a Distinguished Service Medal for his services during the period. A new staff section was created at the headquarters of the U.S. Air Forces of Europe in June of 1948. The new position was patterned after the Inspector General of the Air Force in Washington. Colonel Drake was the natural selection for the position since he had been serving as Inspector of the U.S.A.F.E. since January of 1948. In his new position, Colonel Drake supervised the staff sections of the Air Inspector and the Provost Marshall. It was during 1948 when the United States Air Force began the airlift to help the citizens of Berlin. Col. Drake was admired by his staff officers, who dubbed him "The Little Colonel with the big eagles," - his silver eagle insignia denoting his rank. and a Europe-Africa-Middle East campaign ribbon with two battle stars. After his retirement Drake and his wife returned to her homeland in France. Mrs. Drake had lost homes in both wars when the Germany army invaded France in 1914 and 1940. The Drakes returned to this country. General Drake lived the last 18 years of his life in Sarasota, Florida. After a prolonged illness, the "Little General" passed away at the Extended Care Nursing Home in Sarasota on March 6, 1971. Funeral Services were held in St. Paul's Catholic Church. General Drake was honored by his country, which he loved so much, with his burial in Arlington National Cemetery in Arlington, Virginia. Known as "Ducky" to his closest friends, Drake never ducked when it came to serving his country. He made sure our planes were built right and kept them flying. He was just a good ol' country boy, who when his time came, served his country to the best of his ability.